Maxar planned to build and commercialize DARPA's RSGS servicer, which would have helped jumpstart the satellite servicing industry. Credit: DARPA. Former RSGS program manager Gordon Roesler: ”The RSGS capability is so revolutionary, the nation really needs to find a way to get it on orbit." WASHINGTON — The news on Wednesday that Maxar Technologies bowed out of a partnership with the Defense Advanced Research Projects Agency to build an orbiting satellite servicing vehicle is a reminder of the risks that the government and private companies take on when they sign cost-sharing deals, experts and analysts told SpaceNews. Maxar’s SSL division cited business and financial reasons in ending its participation in the Robotic Servicing of Geosynchronous Satellites, or RSGS, program. DARPA launched the project in 2016 and in 2017 selected SSL as its commercial partner under an agreement known as Other Transaction Authority. In OTAs, the government and contractors commit to sharing the cost of a project, with the expectation that both parties end up benefiting from the investments. This is a painful turn of events for DARPA, said former RSGS program manager Gordon Roesler, who played a central role in setting up the partnership with SSL. Roesler, who is now retired from government service, predicts DARPA will figure out a way to salvage the program. “The RSGS capability is so revolutionary, the nation really needs to find a way to get it on orbit,” he said. When DARPA conceived the RSGS, it concluded that the spacecraft had to be from a commercial company if it was going to service satellites in geosynchronous Earth orbit. “We had to show that this was not going to be some nefarious military sneaky device that would go after other people’s satellites,” said Roesler. DARPA in February 2017 selected SSL as its RSGS partner over competitor Orbital ATK (now Northrop Grumman Innovation Systems). Roesler said he stands by that decision because SSL submitted a “superior” bid. Orbital ATK’s subsidiary Space Logistics developed a commercial robotic spacecraft to service satellites in geosynchronous orbit. 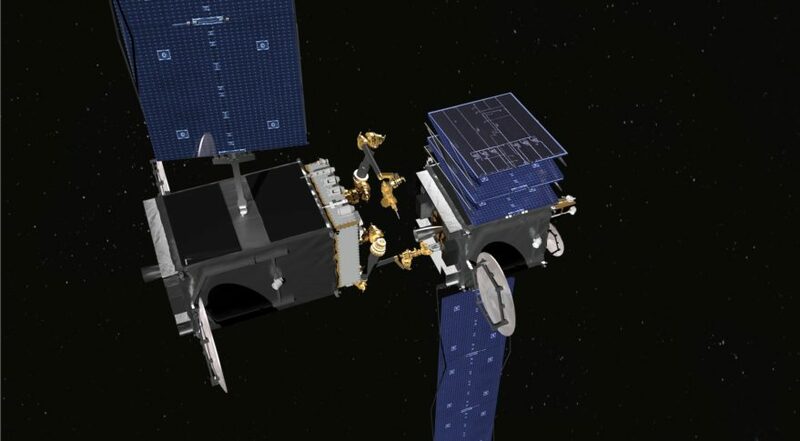 After DARPA announced its decision to award SSL a $15 million contract for RSGS, Orbital ATK filed a lawsuit in a federal court arguing that DARPA was violating the 2010 National Space Policy, which directs government entities to “refrain from conducting United States government activities that preclude, discourage, or compete with U.S. commercial space activities.” But the court in February 2018 sided with DARPA. In just two years since the deal was signed, the business climate has changed, Roesler noted. SSL was producing six to eight GEO satellites a year; now it is considering divesting the business. “They were going to fund this out of their operating capital.” The calculus was that the company would finance the project for several years and recoup the investment from on-orbit operations. Roesler had estimated it would take about three to five years of on-orbit repair work to recover the upfront investment. But that was before the GEO downturn. To outside observers, there was no obvious sign that RSGS was in trouble. DARPA last fall fought to get funding in the Air Force’s 2019 budget to make sure a launch contract could be awarded on time to get RSGS into orbit by spring 2021. In a statement on Wednesday, DARPA said it will spend the next few months evaluating other options for RSGS, including a potential re-competition or restructuring of the program. Northrop Grumman did not respond to questions from SpaceNews about any plans to re-enter the program. That said, Roesler believes this is a hiccup and not a harbinger of trouble for the satellite servicing industry at large. According to recent market analyst by NSR, the satellite servicing industry is poised to reach $3 billion a year some time in the next decade. But Weeden said there is still a lot of work to be done to help enable a successful commercial satellite servicing industry. A number of key projects are moving forward. Northrop Grumman said it plans to launch its first Mission Extension Vehicle to dock with Intelsat-901 and take over orbital station-keeping duties, extending the satellite’s service life by several more years. Another up and coming player, Effective Space, is developing a satellite servicing vehicle called Space Drone, to provide satellite life extension services. And SSL is under contract to NASA to build the Restore-L satellite servicing spacecraft, slated to launch in 2020. Restore-L will be owned by NASA, however, and will operate in low Earth orbit, not the geosynchronous arc as was the plan for RSGS.